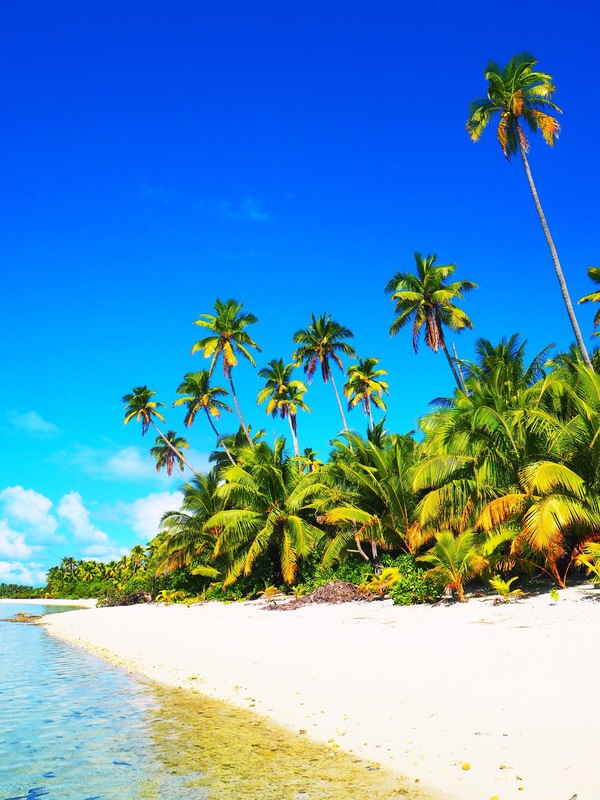 Cook Islands – Sometimes the wrong train will get you to the right place. The considerably longer-distance Tahiti – Rarotonga flight was operated on a typical Tahiti Air ATR prop plane, so we cruised just above the clouds for some three hours until we arrived in the Cook Islands. We touched down in Rarotonga, capital and largest island of the Cook Islands, in the afternoon. 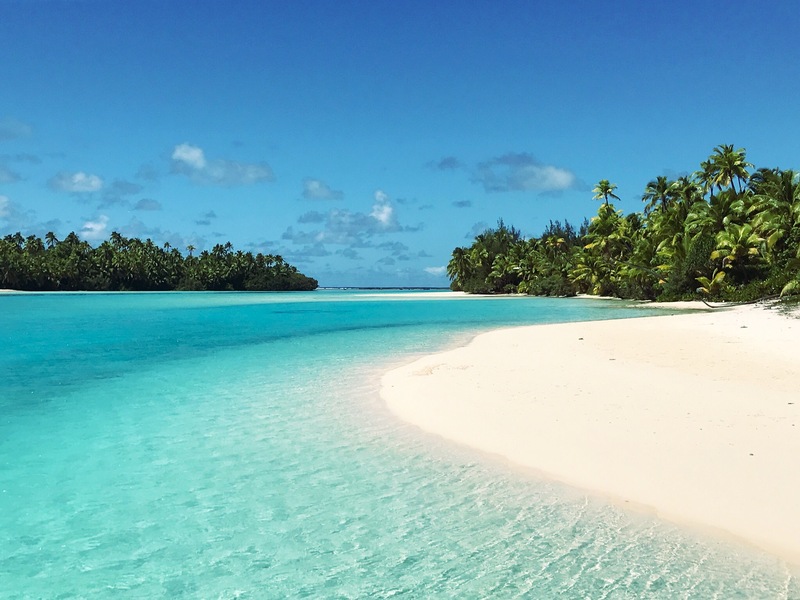 We had a booking for one night on the west side of the island before our stupidly early flight the next morning to Aitutaki, one of the smaller islands in the archipelago. We didn’t have time to do or see much on our stopover in Rarotonga, and it was raining, so we mostly just hung around near our accommodation. There was a bit of a party at the hostel that we thankfully slept soundly through, but we awoke to the carnage featuring several broken bottles on the floor and a kitchen full of dirty dishes. Somebody had apparently taken Oona’s flip flops from the front porch as well, as they were not where she left them and nowhere to be found. At 5:30am, it was far too early to do much about it, especially considering that our taxi was waiting for us, so Oona left flip flop-less. Our flight departed from right outside a glass door at the airport –no security or ticket check at all— and we walked from the terminal to the aircraft, some 100 meters across the tarmac. Used to the small, 50 passenger flights in French Polynesia, we boarded a much smaller 15-seater prop plane; small enough to look down the aisle and see out through the cockpit window. No bathroom or staff (aside from two pilots) was to be found. The rest of the seats were filled by the Rarotonga rugby team, heading to Aitutaki for a game that night. We landed in Aitutaki, the airport of which is an even smaller, even less serious affair than those that we saw in French Polynesia. The rugby team piled onto a truck waiting in the parking lot, and a nice fellow (there seem to be a lot of them in the Cooks) asked if we were waiting for a pickup. Due to a mix-up in our booking, we thought our guest house would be coming to get us, but after 15 minutes we concluded that they were not. The nice fellow from earlier offered us a ride, and gave us a brief rundown on how the island operates, pointing out this and that shop, restaurant, or attraction along the way. 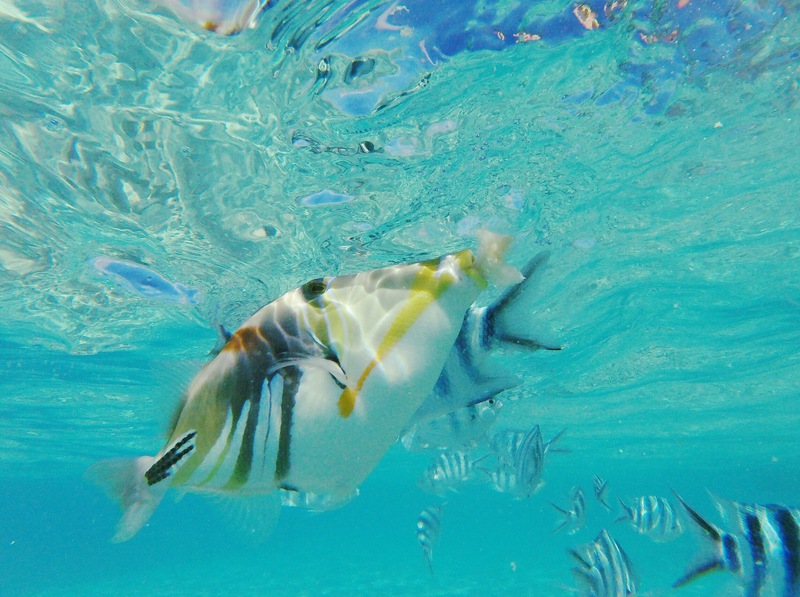 A motu in Aitutaki’s lagoon. Our inbound plane was so small that Oona’s bag had to be put on the next flight, several hours later. Our first order of business was finding a place to rent a scooter, as we figured that was the only practical way of getting around the island. Conveniently, there was a scooter rental place, Rino’s, several dozen meters from our doorstep at Tom’s Beach Lodge. Tom’s is the cheapest option on the island, offering very basic double rooms for NZ$40 (about $28) per night. The family that owns and operates the place is pretty decent sized, and fortunately one of the grandchildren was on his way to school just as we were arriving, so he called his granddad to come get us settled in. The friendly grandparents, chattering away in Maori between themselves, showed us to our room, which had a dead crab on the floor. We pointed out the crab to the gasps of the proprietors, and they set us up in a different room, sans crab. Over the following days we got to know the others that live here, and the operation mostly seems to be run by the grandparents’ daughter, with her children helping out from time to time. The family was very helpful and nice, and the facilities are what you’d expect for such a price. We grabbed a scooter from Rino’s, and were beginning to conclude that pretty much everybody on the island is super nice. Rino’s rents scooters for only NZ$20 (about $14) per day, which is well worth the price in our opinion. We made our way back to the airport in our newfound wheels just in time to pick up Oona’s bag as it arrived. Word on the town was that there was a rugby match that night, which explained the presence of the team on our flight, so we made it a point to find the field at around 5pm, which we were told is near the main wharf, right in the center of town. We sat on the sidelines with what we supposed was the home crowd (judging by the size) and cracked open a couple of beers. 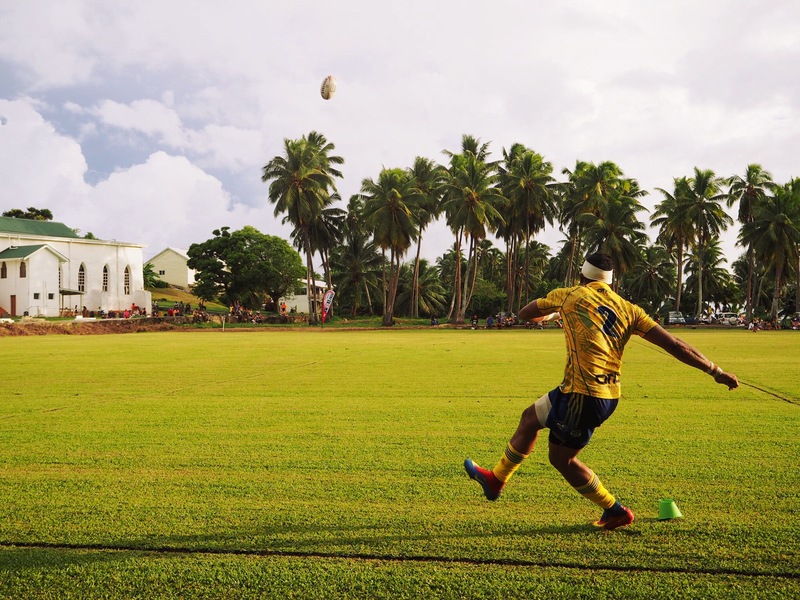 The Aitutaki Sharks proceeded to decimate the visiting Rarotonga team to a tune of 18-14. It really didn’t seem that close for most of the game though, but all our score reports were coming word-of-mouth, considering the lack of a scoreboard of any sort. We suppose the visiting team could chalk up the loss to having been awake for at least 12 hours at that point, and if our feelings were any indicator, they were tired too. The Sharks eating the Eels. The town, flying high after their victory, made their way over to the Fisherman’s Club (some sort of event space, we gathered) next door to celebrate. We sat amongst the crowds for a bit, but it became awkward after the many congratulatory (or at least so we speculated) speeches, one after another, in Maori, so we made our way home. In tune with the local way of life, most of our time was spent relaxing. 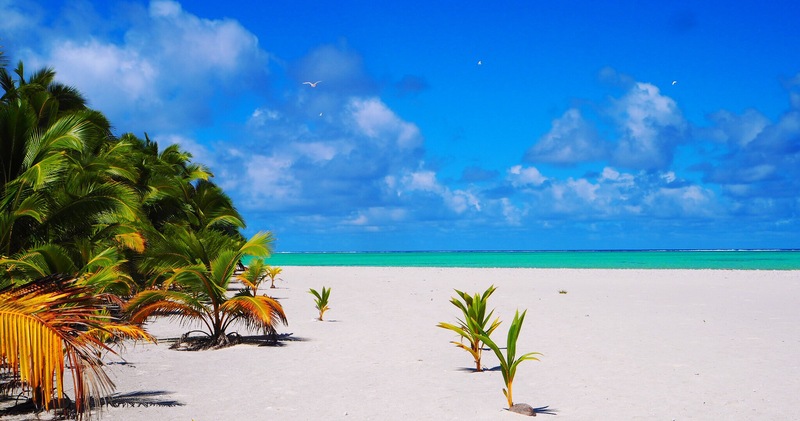 We’d cruise up and down the dusty roads of the island, settling on this beach or that for awhile, refilling our bottles at the communal water tank (which is an awesome asset, by the way), or sitting for a cup of coffee at one of the few cafes. None of the beaches of the main island are that nice, actually, mostly populated by thousands of sea cucumbers lazing on the sand underfoot. 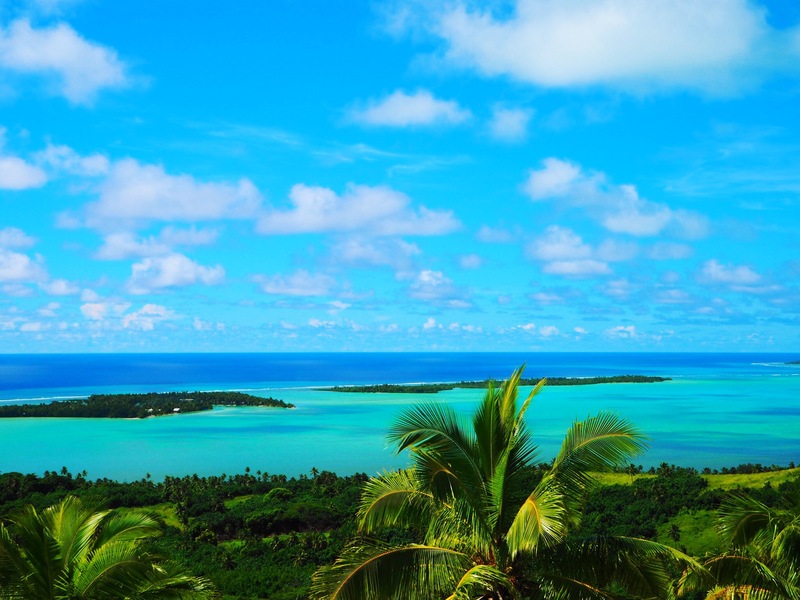 The real gem of Aitutaki is its lagoon, stretching for some kilometers southwards. With this in mind, it’s critical to make it out onto the lagoon at some point. 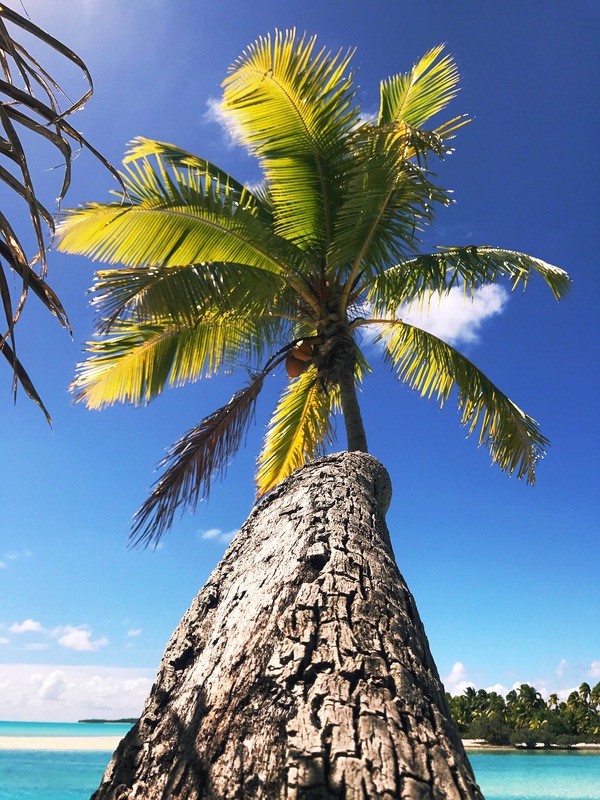 We went on a tour with Aitutaki Adventures (which was a recommendable organization), but there are a handful of other providers as well. Most of them are a bit over NZ$100 ($70) per person, which includes lunch, snorkel gear, and transport to and from the lagoon. Our particular tour visited only two islands and a sand bar, so we got a bit more time to relax on the islands themselves, which are basically the prototype of tropical paradise. We stopped off for some snorkeling in the crystal blue waters along the way, which was also quite fun (although the corals leave much to be desired when compared to what we saw in the Maldives or French Polynesia, but the water was unbelievably clear, and there are a fair amount of fish). We were so enamored with the small islands around the outside of the atoll that, as we sat on the beach the following day, thinking something like “it sure would be nice to be out on one of those islands over there…”, we headed back to town to pay somebody with a speed boat to take us out to one. Mona’s Water Taxi on the main road is just such an organization, and the driver, Daniel (we’re not sure why it’s named Mona’s…), had a bit of free time to take us out to Maina Island for the day. We packed a bit of lunch, a couple bottles of water, and headed out to spend the afternoon on the island. It was a perfect little slice of paradise all to ourselves. We spent our time snorkeling, playing with hermit crabs, and dodging the dive-bombing gulls nesting on the island’s interior. Daniel came back to pick us up at 5pm, but we had half a mind to spend the night there. For what it’s worth, doing so is totally feasible. There are a couple makeshift shelters on the island, used by some day trips for a lunch spot, and there are plenty of coconut trees from which to hang hammocks. Totally randomly, a couple who we met on Fulidhoo in the Maldives is now working on Aitutaki, so we had the good fortune of meeting up with them for lunch. We shared stories of our past year, the places we enjoyed, the things we saw, etc, etc. Not long later and we were on our flight back to Rarotonga (on a much larger plane this time). Aitutaki’s cargo ship in the distance. 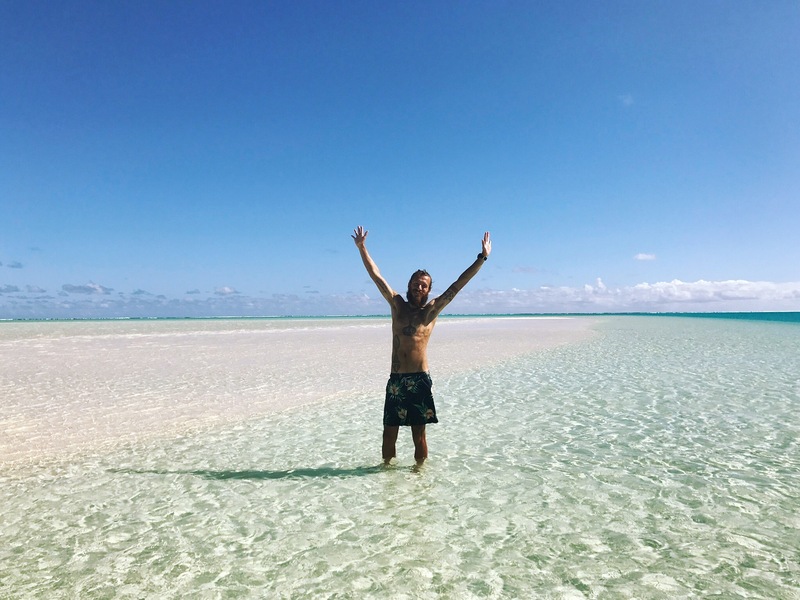 We booked the cheapest option on Airbnb in Rarotonga, which was Tyronne’s Beach Front property. The eponymous Tyronne came and met us at the airport, but a bit of confusion led us to believe that he was going to give us a ride to his place, but he only had a motorbike, so he took Oona while Ian hitchhiked on the main road. Several dozen cars passed before a ride was given, but again out of sheer coincidence, it was a rugby player from our flight to Aitutaki who gave him the ride. Jay was his name, and he recognized Ian from our scooter escapades on Aitutaki. 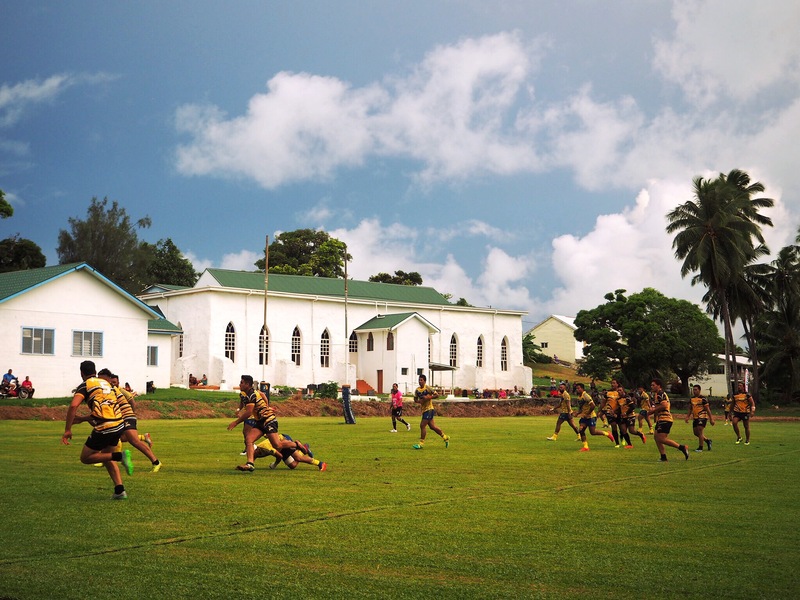 A church on Aitutaki. It was too rainy in Rarotonga to take many pictures. 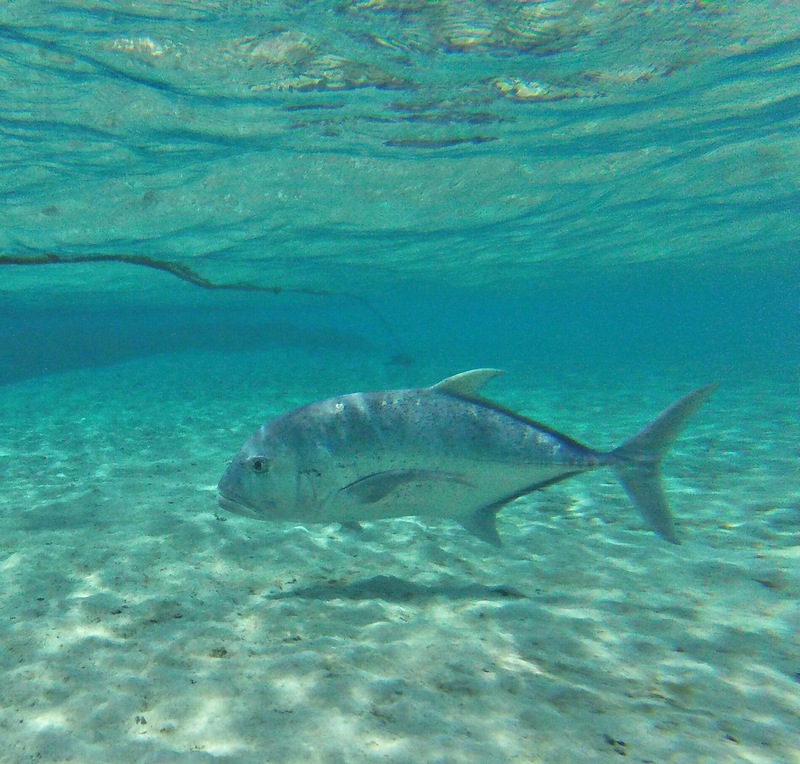 Our productiveness in Rarotonga was quite limited due to the terrible weather. We mostly hung out with Tyronne at his place, but we got a chance to see a bit of the island the following day, in between fits of torrential downpour and thunder. 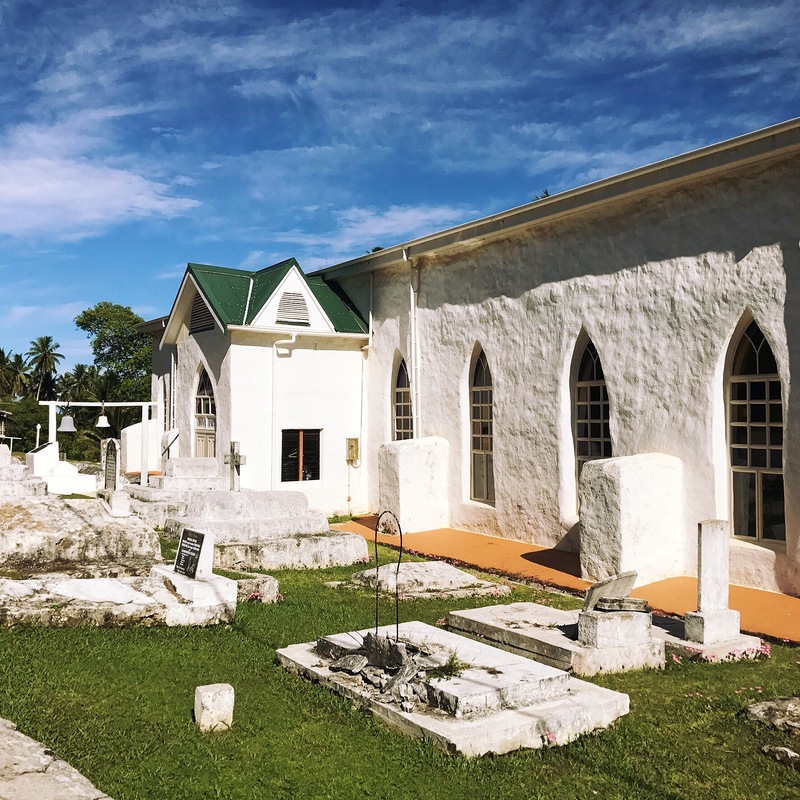 We did manage to explore a bit, and we visited the Matutu brewery, which is a local craft brewery which is actually quite good. They filled up some 1.5 liter plastic bottles with their product right out of the tap for NZ$15 per bottle (only NZ$2.5 per half liter) for our enjoyment later that night. We also happened upon a gathering of people watching the takeoff of a decent sized 787 from the airstrip, which was pretty amazing. 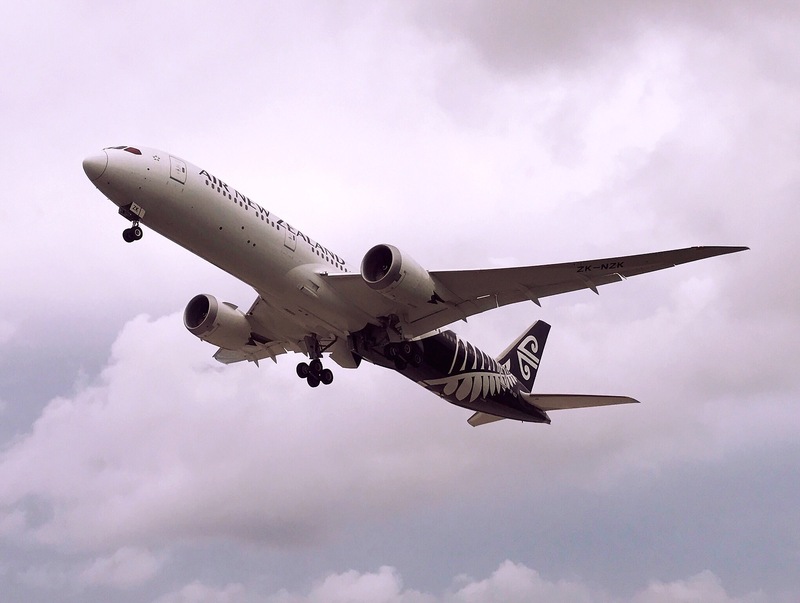 Air New Zealand 787 leaving Rarotonga. We bought a few fillets of fresh marlin from the Ocean Fresh fish market near the airport, and Tyronne cooked them up into a delicious curry. It was certainly outside the scope of his duties, as we were simply staying at his place, but he insisted on cooking amazing food for practically every meal for both days that we were there. He was a pleasant conversationalist, and our time with him was very well spent. Overall, a thoroughly recommendable Airbnb accommodation. All the while, we were dealing with a massive administrative pain. We had accidentally booked tickets from Rarotonga to Sydney with Ian’s last name missing the final letter. After a series of emails back and forth with Tripsta, the booking agent, we concluded that we would need to call them in order to get the name changed, as they were going to charge us 85€ for the simple fix. 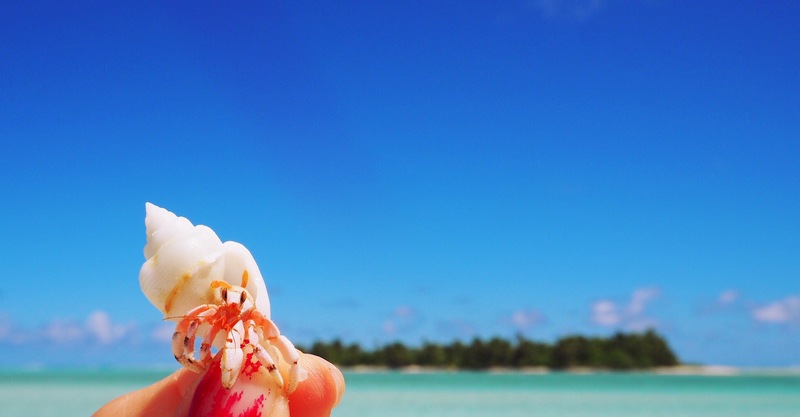 After spending more than 30 minutes on hold and much money on data (Internet connectivity in the Cook Islands is not cheap nor easy to find), we thought that the problem was solved. Two days later, they informed us that an additional 122€ (!) was needed to simply change the damned name! This was only a matter of days before our flight, and their history of responsiveness (or lack thereof) was concerning. We had already talked to Air New Zealand (the flight operator) on the phone, and they had told us that we needed to deal with Tripsta directly. Nevertheless, we made a last ditch effort to contact Air New Zealand by visiting their office in Rarotonga, and the friendly clerk corrected the name for free in a matter of five minutes. Relieved, we left the office, concluding that we would not be relying on Tripsta’s inept services in the future. We boarded our flight the following day and were whisked across the Pacific to Australia in a little under 7 hours. 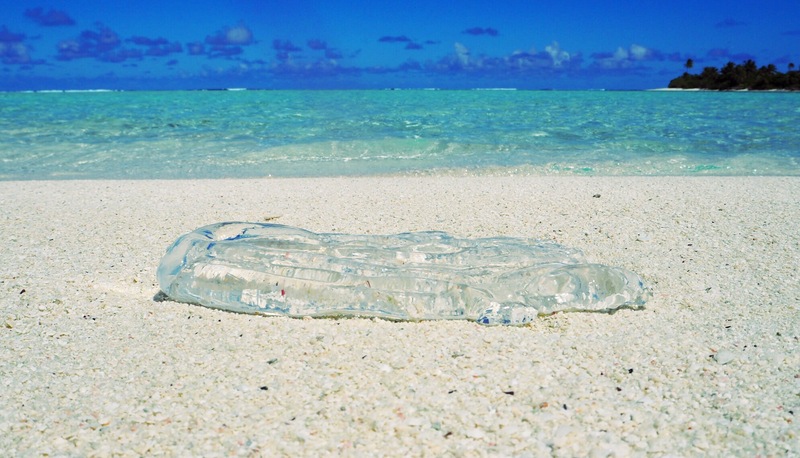 A beached jellyfish on Aitutaki.